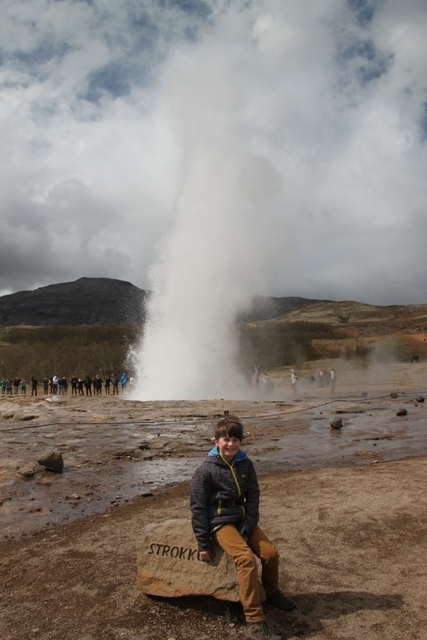 After Thingvellir, next stop was Geysir – part two of the Golden Circle and just 45 minutes drive away. We chose to ignore the sat-nav when it attempted to direct us onto a road that was, in our opinion, distinctly “unroad like!” A gravel track, barely wide enough for our little car and seriously steep – we decided it was not for us and stuck to our guns by taking the longer route. 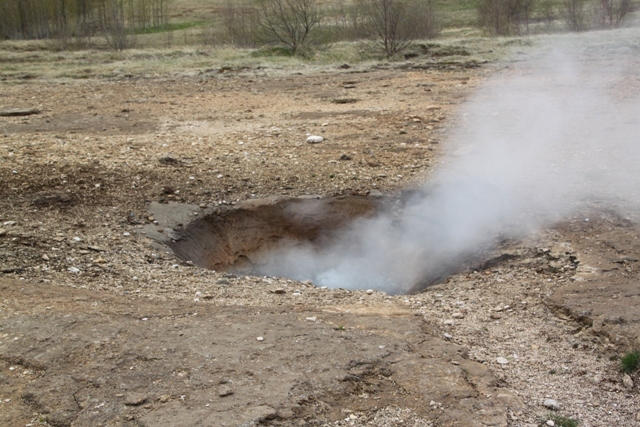 Amazingly when we got out of the car at Geysir, it felt a lot warmer than Thingvellir – could it be the hot springs? The winds had also died down and were nowhere near as biting as in previous days, it was starting to feel altogether pleasant. 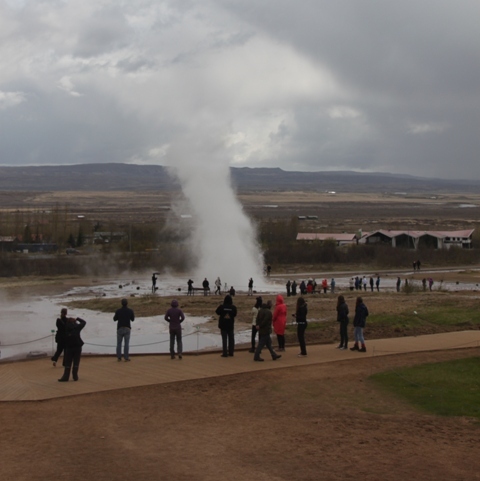 We had a look inside the visitors centre at Geysir – delicious coffee and cakes in the cafe and a view of the hot springs – perfect. They have a multi-media exhibition there too, we paid to go in, but as soon as we did, realised it was a complete waste of money. There was not much at all to see. They did have an interesting exhibit about the volcano which erupted in 2010 (the one I can’t spell), and caused all the chaos for air travel in Europe with the ash cloud. Apparently you can visit the lava fields near this volcano and the lava is still really hot. 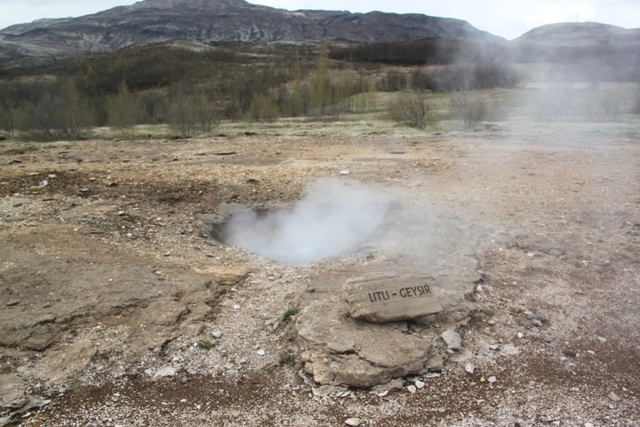 The real star of the show at Geysir though is unsurprisingly the geo-thermal area across the road. Our 9 year old was totally fascinated and awestruck – he made his own film to bring into school and show his friends. He thought it was just amazing. It is. Steam rises out of the ground from every crack and crevice. The area is full of primitive and weird looking plants and the earth is multi-coloured and is constantly bubbling and sizzling. We had a look at all these belching mud pools and then came upon Geysir. It gave its name to all the other geysers, but sadly nothing happens at the original one now. It has been inactive since 1916 – apart from one eruption again in 1935 there has been nothing ever since. We did see Strokkur erupt though – that is pretty cool. 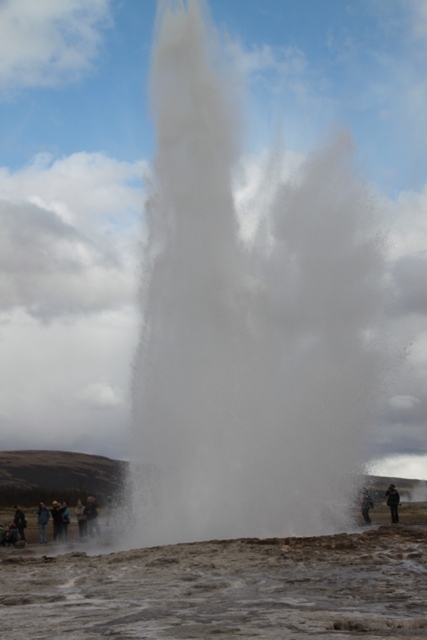 It is close to Geysir and they say it is the most reliable geyser in the world. It blows every 10 minutes and the boiling water spouts up about 30 metres in the air. Our 9 year old was so impressed, we stood and watched it erupt 6 times. You can get really close, it is hypnotizing to watch the water bubble and sizzle as it gets ready to go. Just don’t stand too close and don’t stand downwind. You take your chances here – no safety barriers or any of that nonsense. Just common sense. The whole geothermal area is quite small, so it doesn’t take long to wander around and see everything. Our son pretended he was a witch, making spells and this was his huge bubbling cauldron. It is definitely a place which engages active imaginations. Just good to be there on such a cold day – boiling water helps to warm you up!